GameFAQs: How to use Metapad for Linebreaks at 79 Characters and what's Wordwrap got to do with it! How to use Metapad for Linebreaks at 79 Characters. First of all, thank the guy (must have been a guy as there are no girls on the internet) from the GameFAQs contributor boards who linked you here, because on this very page you will find a nice description on how to convert your plain .txt file which is over margins to a linewidth of exactly 79 Characters per line so that it will easily pass the site's strict policy on that standard. If you are using metapad already and just don't know how to break your lines without using excessive violence you can skip this paragraph and quickstep forward to step number 2. There is no installer for Metapad, just create a new folder called Metapad somewhere on your harddrive and copy the files you find in the zip-archive to this folder and then run metapad.exe. and follow the instructions on the page for the language plug-ins. There you go, this was the first step, and it's not been difficult at all, or was it? You now have to resize the window to exactly 79 Characters length/width or this little magic trick described in Step 3 later on won't work. That's all about the resizing of the window. Let's move on to part 3 of this exquisite, yet free Tutorial. After you worked your way through the first two chapters you now have a Metapad window that is resized to 79 Characters width. So now you can paste your finished FAQ into Metapad just like you would paste something into notepad or writer or word or whatever program you use to process your writings. But make sure to use a fixed width font like Courier New or Fixedsys so you see the text as it is displayed later on GameFAQs. Then you see your text still flows under the end of the window and won't stop till it gets enough. So here comes the first half of this black sugar magic. 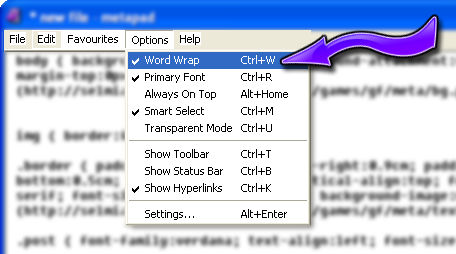 Click on Options and choose Word Wrap. 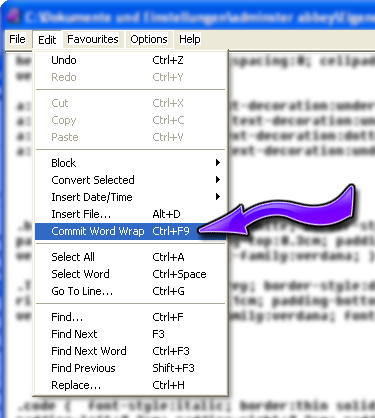 Alternatively, if you enabled the toolbar, you can click on this button or you can press CTRL + W to turn on Wordwrap. As you see, the text won't flow over the windowsize anymore but start a new line everytime it hits the end of the window. So stay with the 79 Characters size and then go to Edit and choose to Commit Wordwrap. As you see on the picture you can also press CTRL + F9 as a shortcut. Now it is done. Try resizing the Metapad window (to a bigger size of course). You see, all the text stays where it is and won't adjust to the windowsize. That's because now all lines in the whole document are 79 Characters long or shorter. In case you're not sure if what you just did was all correct it is a good idea to save the wordwrap'd file as a new version of your FAQ. Then you can still check if every wordwrap was in place. It could happen that wordwrap tears apart a table or is just out of place. After this and while still everything is highlighted you can also press ALT + W to get rid of useless whitespaces at the end of the line that sometimes make your file 80 characters wide even though you don't see them. These additional whitespaces are called trailing spaces on GameFAQs. Build it up! Tear it down! So you commited wordwrap on your whole document. Fine. But now you find out about some groundbreaking news for the game you are writing for and have to insert some more words into one paragraph. You start writing and see all lines are completely off and you have to push backspace at the end of each line to get back to continuous text that you can then wordwrap again. That's a stupid job. But fear not! Metapad can do this for you! Just highlight the paragraph you want to de-wordwrap and simply press ALT+F9. Remember, this eliminates ALL linebreaks in the paragraph. Think about which linebreaks you want to keep before de-wordwrapping the text. 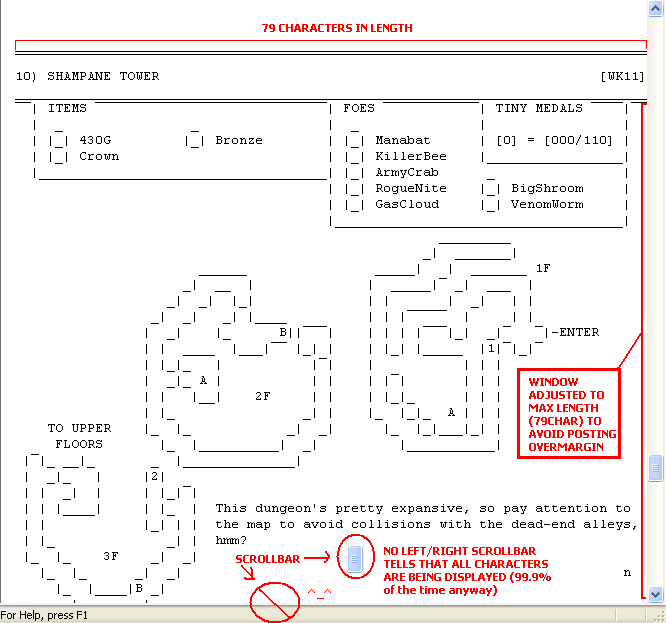 If you press only F9 on highlighted text the linebreaks and the spaces after or before the linebreaks will disappear. Sometimes this can be useful, but most of the time it's not. That's what ALT+F9 is for. What is this now? You better read on! Whoa, wait, there is more. If you had no problem following this tutorial you won't have any problem doing one last thing to ease things up for you (again, working with computers seems to make you lazy. Same goes for pot, but this also gets you high, but that's another story, don't do drugs kids!). Click on Options and choose the Settings. The Settings window pops up. 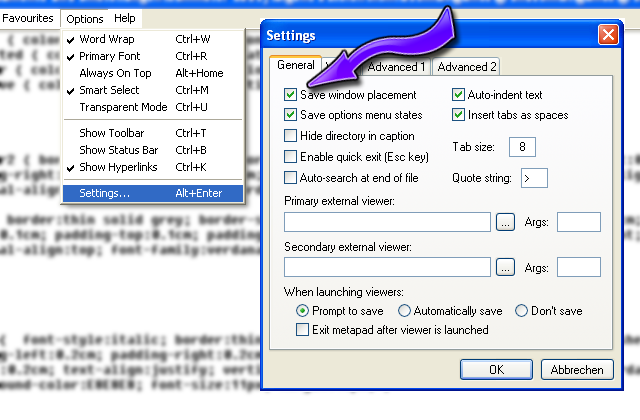 There you choose in the General-Tab (which should be open by default) to save window placement. This setting tells Notepad every time you open it up in the future to remember the size you closed it with. In this case 79 Character long. Isn't that great? Save options menu states is another nice feature and you should check it as it remembers to keep word wrap enabled. And finally the Insert Tabs as spaces is also a cool feature as it, surprise, lets you use tabs while FAQing and converts the tabs to spaces so you can submit the .txt file without problems. Just set the tabs to the desired size and there you go! 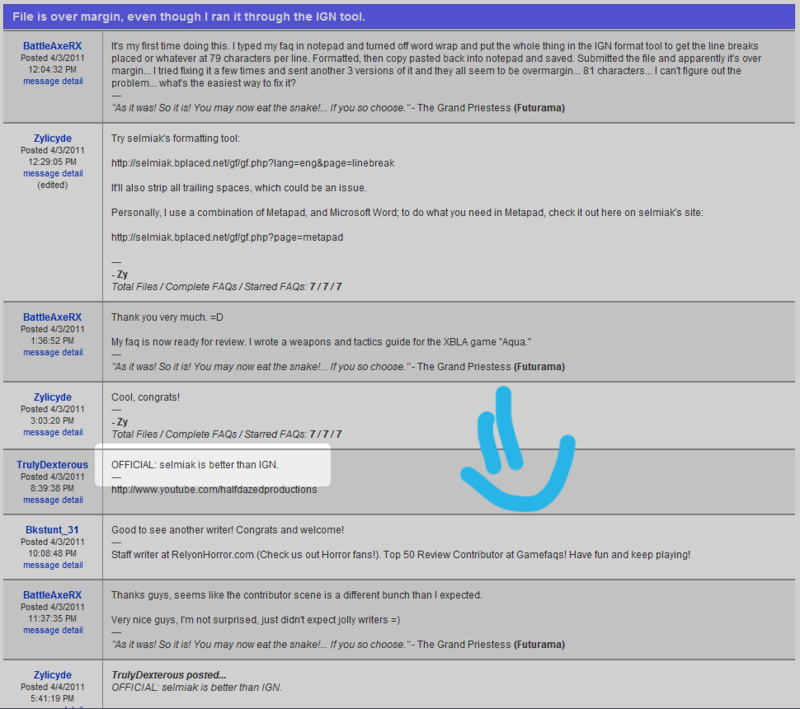 > The GameFAQs Contributor Board for introducing me to Metapad in the first place. > _Lagoona_ for various additions to this text. > Timmy Vermicelly for the addition, that you can also use Fixedsys as a fixed width font. > ACowWithaDS for the Link to the IGN Formatting tool. > Shotgunnova for the screenshot of Metapad with the additional explanations. > vinheim for the ALT+W to get rid of trailing spaces. Staying on this page for long may kill a kitten.